Description: In My Wildest Dreams - a sister for Crazy Dreams. 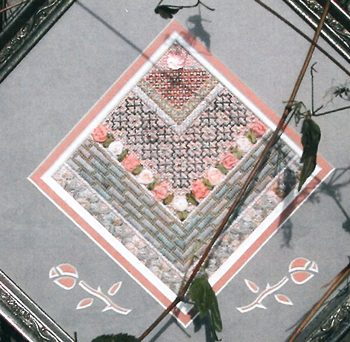 An intermediate to advanced canvaswork. We all have a delightful thread collection that we have purchased over time or we have leftovers from another project. This is the project they have been waiting for. 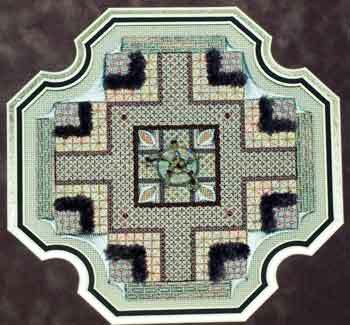 Because this is a crazy patch design, you do not have to use a specific color to achieve a shadow or a depth as in most projects. 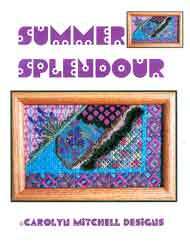 Some threads do lend themselves to certain stitches and this will be advised along the way. Please pull threads and cut canvas. Please just send the Design. 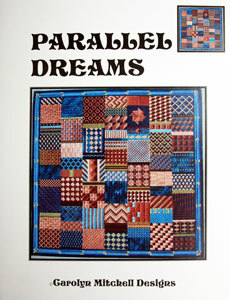 Description: This is for those who have a wonderful collection of threads that they have been planning to use sometime! Your collection will no doubt consist of your favorite colors making it easy to blend colors together for this project. 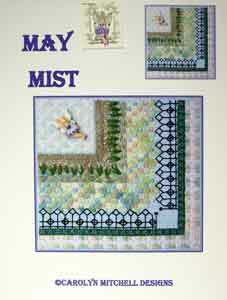 Includes charts and very detailed stitching instructions. Description: 112 by 112 stitches a unique design deplicting the city at twilight. 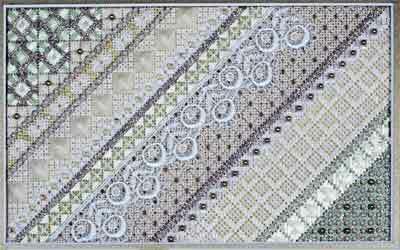 A large variety of stitches and exciting fibres from The Caron Collection™. 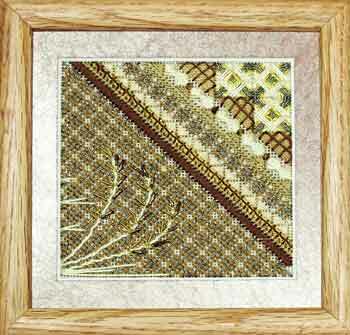 Description: 88 by 136 stitches a breath of spring is offered in soft yellows, white, gold and green. 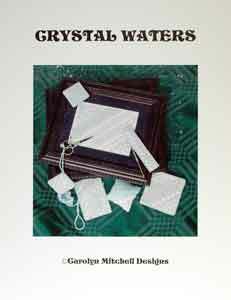 A large variety of stitches, featuring a variety of fibres , beads, lace and crystals. 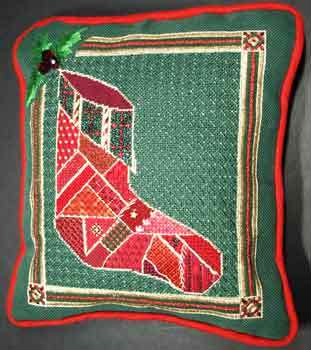 Description: An exciting crazy patch stocking worked on Victorian Green canvas. 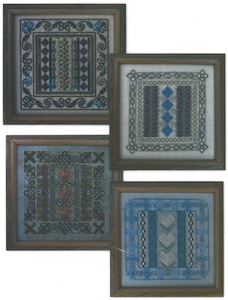 A large variety of stitches and threads creating many shades and textures. 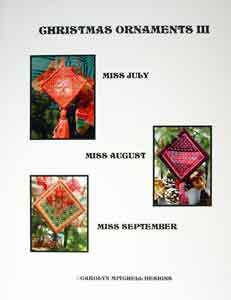 A design to enjoy year after year. 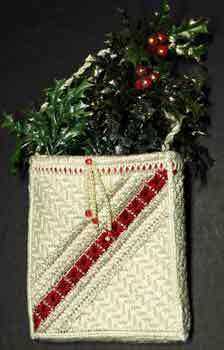 Description: One of six wonderful little bags are created using 18 count Mono Interlock canvas, perle cotton and Kreinik Ribbons and Braids. They can be used as ornaments, or table favours. 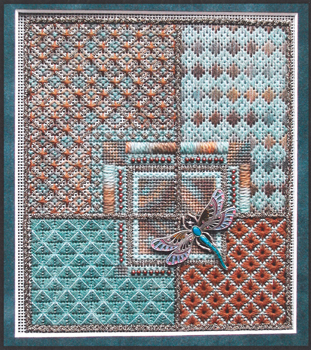 Description: Six more enchanting little bags using 18 count Mono Interlock canvas, perle cotton and Kreinik Ribbons and Braids. They can be used as ornaments, or on door knobs. 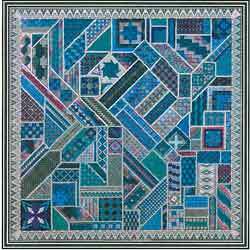 Description: One of eight fascinating 2 sided ornaments all 40 by 40 mesh worked in either Treibzond Silk or Perle Cottons is Mulberry and Ponderosa Green. 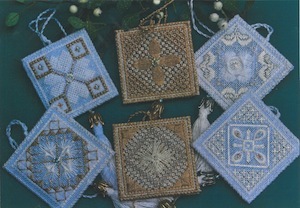 Various stitches plus Lacy Binding Stitch with beads! 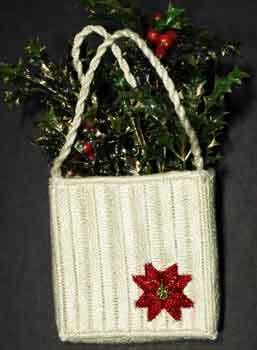 Description: One of eight charming 2 sided ornaments , all are 40 by 40 mesh and worked in cream #5 Perle Cotton and gold metallics. 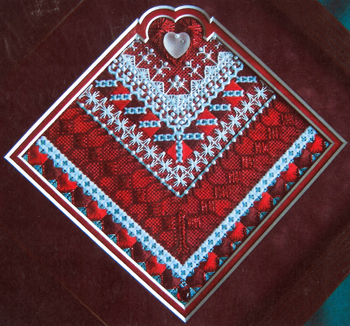 A large variety of stitches including the Binding Stitch. 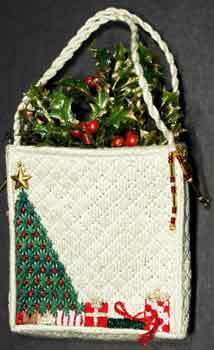 Description: One of seven charming 2 sided ornaments , all are 40 by 40 mesh and worked in cream #5 Perle Cotton with red and green metallics. 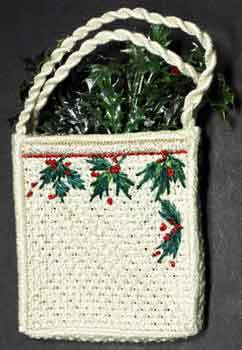 A large variety of stitches including the Lacy Binding Stitch. 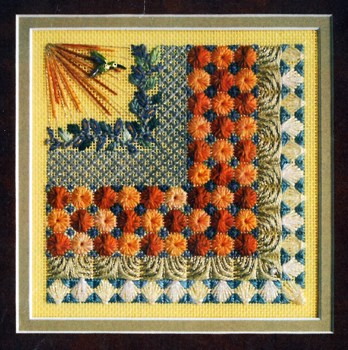 Description: 72 by 72 stitches a charming design representing the prairies. 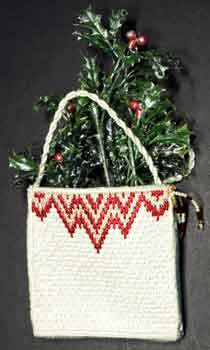 A large variety of stitches including Trelliswork, fibres including Antica, Bright Chek and Rough Purl. 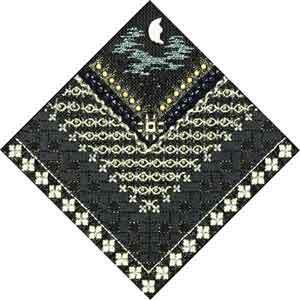 Description: An enchanting 136 by 136 Stitch design with a variety of stitches and fibres. Other colour ways are Spring, Autumn and Holiday. The cente hides a sterling treasure. This design was featured in A Needle Pulling Thread. 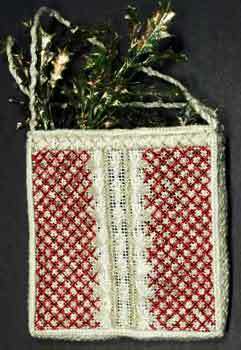 Description: One of six more enchanting little bags using 18 count Mono Interlock canvas, perle cotton and Kreinik Ribbons and Braids. They can be used as ornaments, or on door knobs. Description: Canvaswork. A delicate, frosty set of 10 ornaments with edible names. Levels: Basic, Intermediate and Advanced. 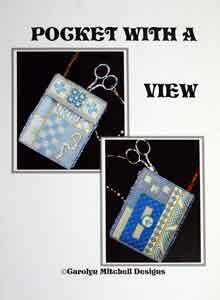 Description: The Needlework Pocket can be used to store your needle, laying tool, and scissors. The inspiration for this design derives from viewing the stunning contemporary stained glass that many artists are creating today. In days of old, stained glass was bold, with bright colors; today the colors achieved are often soft and restful to the eye. Description: This trio of ornaments, with glimmers of gold and red, gently move on the Holiday Tree offering beauty and peace to the season. 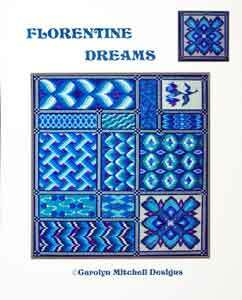 Description: Thirteen different Florentine designs creates this stunning piece featuring a simple border of cross stitch and waffles. 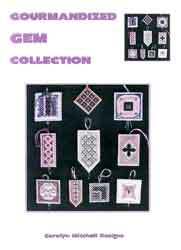 Description: 8 fascinating two sided ornaments worked in either Treibzond Silk or Perle Cottons. 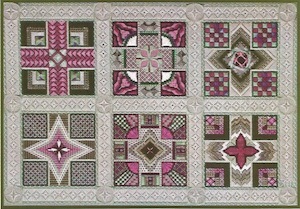 Various stitches plus Lacy Binding Stitch with beads! 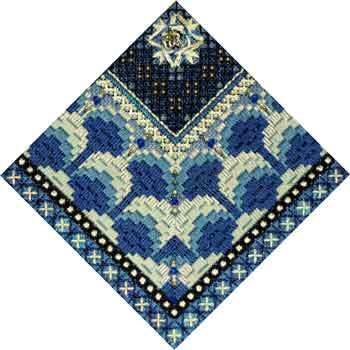 Description: This is a study of stitch patterning using many of the same stitches but placing the color values in different areas for delightful results. 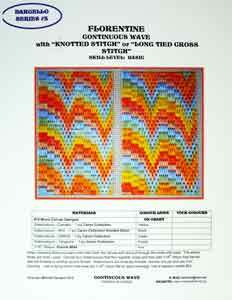 Florentine: Continuous Wave with "Knotted Stitch"
Description: Bargello #3. Basic skill level. 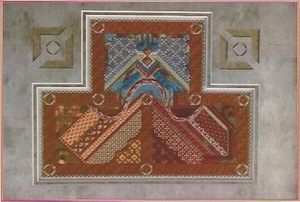 Florentine: Four-Way with "Queen Stitch"
Description: Bargello Series #4. Advanced skill level. Description: Ejoy the colors of a clear spring morning. And don't forget the fairies! Intermediate to advanced skill level. 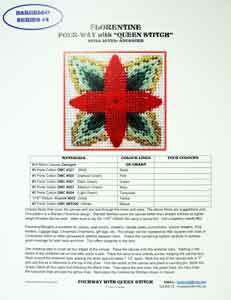 Includes Susan Clark fairy embellishment. 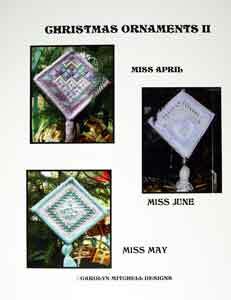 Description: Three Christmas ornaments representing the months of April, May and June. Intermediate skill level. 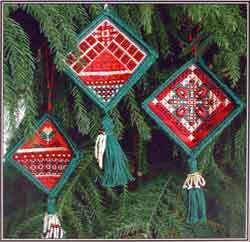 Description: Three Christmas ornaments representing the monthsof July, August and September. Intermediate skill level. Description: This six-piece ensemble consists of a needle case, pin cushion, tekobari holder, scissor sheath, scissor fob and magnet cover. Blue and sea green color options. 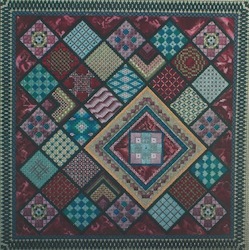 Description: 5x5" design on red canvas. 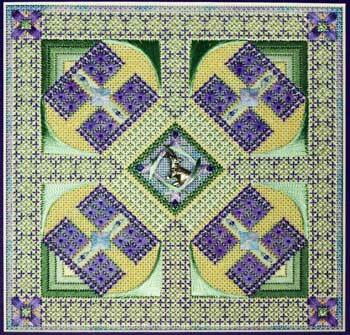 Description: A 5.5x6" design available in two colorways: Brass or Silver. 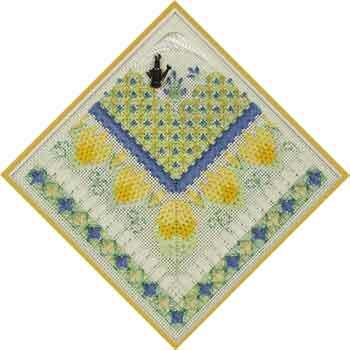 Description: 5.5" design on Butter canvas. 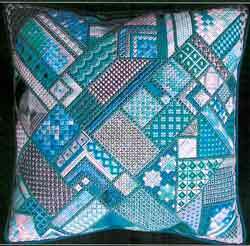 Description: A 5x5" design available in five differenc colorways: Mauve, Sage, Grays, Blue, or Black. 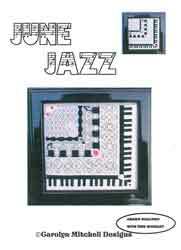 Description: A 5x5" design on Mushroom canvas. 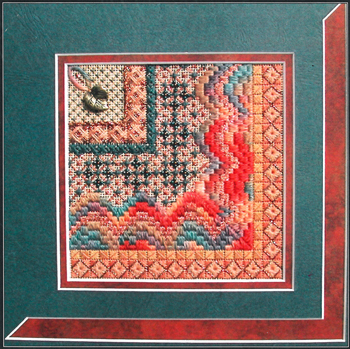 Description: A 5x5" design on Ash Rose canvas. 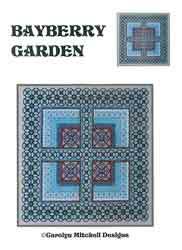 Design Size: 12 x 8.875"
Design Size: 9.77 x 14.22"